You can’t believe everything you read on the Internet. How do you evaluate the reliability of online information? Click this link to register today! And, click this link for the program. One of the most monumental aviators in American history General Chuck Yeager will present a talk on Thursday, November 3, 6:00 to 8:00pm in Hangar 37 at Pacific Aviation Museum Pearl Harbor. "General Yeager is a long time supporter of the Museum and we are honored he has returned to Hawaii to help the Museum. He will share his flying experiences with our members and guests," said Executive Director Kenneth DeHoff. General Yeager is considered a living legend in aviation, the first person to break the sound barrier, on October 14, 1947. His daring aviation feats set the bar for pilots everywhere and rocketed the United States ahead in worldwide aerospace technology, an advantage the U.S. still holds today. 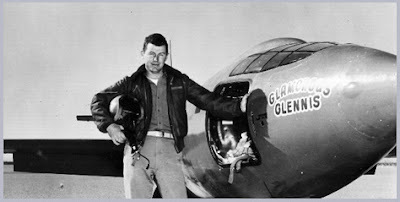 For more information on the General: www.ChuckYeager.com. Gen. Yeager's presentation starts promptly at 6pm, followed by cocktails and pupu reception. The cost is $25 for Museum members and $35 for non-members. Interested in becoming a Museum member? Click Here to join. Reservations are essential to attend. Please call 808-441-1007 or email SpecialEvents@PacificAviationMuseum.org. We've received news of the latest professional development opportunity for social studies high school teachers in Hawaii. Korematsu v. United States: Justice Denied is scheduled to be held at the King Kamehameha V Judiciary History Center in Aliiolani Hale (pictured above) in Honolulu, on Saturday, October 22, 2011. Sponsors include Hawaii's Department of Education's Office of Curriculum, Instruction and Student Support, Curriculum and Instruction Branch, Social Studies Program, in partnership with the Hawaii State Bar Association, the William S. Richardson School of Law, and the King Kamehameha V Judiciary History Center. The workshop will focus on Korematsu v. United States, the landmark Supreme Court case that dealt with the constitutionality of Executive Order 9066. Mr Eric Yamamoto, an internationally-recognized law professor at the University of Hawaii's William S. Richardson School of Law, will be the keynote speaker. In 1984, Professor Yamamoto served as coram nobis co-counsel to Fred Korematsu in the successful reopening of the infamous WWII Japanese American internment case, Korematsu v. United States. He will speak specifically on this case and what it means for all Americans today. Joining him will be Ms. Karen Korematsu, daughter of Fred Korematsu. Ms. Korematsu is the co-founder of the Korematsu Institute. She continues to advance her father's legacy by advising the Institute and speaking at events around the country. Associate Professor Marcus Daniel, University of Hawaii at Manoa, will set the historical context for this landmark case by examining global, national, and local events that precipitated Korematsu v. United States. The Judiciary History Center, in partnership with Ms. Sandy Cashman, former English teacher and award-winning Civics educator at Kahuku High and Intermediate School and current We the People: The Citizen and the Constitution State Coordinator, will assist teachers as they create Hawaii Content and Performance Standards III standards-based lessons for use in their classroom. Strategies for using literacy across content areas will also be incorporated. Participation will be limited to a total of twenty-five social studies high school teachers of U.S. History, World History, Participation in Democracy, and Modern History of Hawaii. Preference will be given to teachers who are not yet highly qualified to teach these courses. Although the content of this training session will not directly address other course (e.g., Psychology, Global Studies, etc.) benchmarks, teachers of those courses who can show an indirect but significant content-benchmark connection may be enrolled on a space-available basis. Applicants must agree to attend the entire training session, create and implement one or more lessons using content and/or processes gained from the training session, and provide student work with teacher commentary that meets the targeted benchmarks. Work may also appear in the Social Studies Instructional Map, now under construction. There will be no cost to attend the training session. Airfare and ground transportation for up to ten neighbor island teachers will be provided by OCISS, CIB, Social Studies Program. No food will be provided; however, a $100.00 stipend will be available. Partial stipends will not be given. To register for this free professional development opportunity contact the Judiciary History Center, or contact us at historyeducationhawaii@gmail.com for the pdf registration form. "On Tuesday last the examination of the scholars of the Charity School took place. Those who were present expressed themselves much gratified by the orderly appearance of the children, and their proficiency in their studies. "On the following day, an examination of the scholars of the native schools occurred. They were assembled at the Rev. Mr. Bingham's church to the number of 700, all in European costume, presenting an interesting spectacle. The examination was said to have been very creditable to the pupils. "The Governor, Captains Wilkes, and Hudson, and Dr. Palmer, of the American Squadron made short addresses, which were listened to with much interest. "The scholars were then marched through the town to the Rev. Mr. Smith's church, each school by itself, bearing an appropriate banner, and the whole procession headed by the young chiefs. Upon arrival there, the whole company sat down to a feast prepared for the occasion. "We regret that we are obliged to speak of these examinations from hearsay -knowing nothing of either until they are concluded. As there are many who would like to be present on similar occasions, we would suggest the propriety of making them known through the columns of our paper. We will gladly give publicity, gratuitously, to any notices for benvolent purposes, or such as are for general information." The Polynesian (Honolulu). October 31, 1840, page 82. I still have 11 fully funded $500 scholarships to give away to Hawaiian schools. Check at http://www.history.org/Hawaiitrips/ for complete details. The trips are live and also archived for 24/7 availability so can be used when it fits a teachers schedule. Please spread the word around, I’d love to give these away! 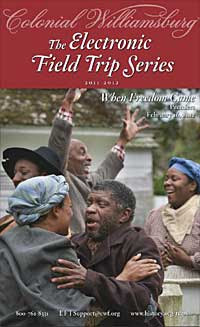 Two teachers who are participating in the 2011-2012 Electronic Field Trips will be awarded a fully funded scholarship to attend the 2012 Colonial Williamsburg Teacher Institute! One full week of outstanding professional development held onsite in Williamsburg, Virginia! All participating teachers will be asked to submit an application for the Teacher Institute and 2 recipients will be chosen for the scholarship, a $2000 value and will include airfare. Hawaii history teachers, students, historians and history buffs! The Gilder Lehrman Institute is pleased to present its latest issue of History Now, a quarterly online journal for history teachers and students. It is available at this link. "In this issue, four leading scholars provide a closer look at the religious beliefs and institutions that played major roles in the lives of colonial America’s women and men, and in doing so highlight one of the critical characteristics of our nation: its multicultural heritage." In addition, the Institute has several podcasts from the Historians on the Record series on the subject of religion in Colonial America. These include John Demos: Religion and Witchcraft in Colonial America and Kevin Phillips: Religion and Politics in the Founding Era. Click this link or download them for free from iTunes.